The pinnacle of the Upward range, the Nobel A4 desk diary has a superior textured PU cover with a blind embossed logo and is luxuriously appointed with Mylar reinforced monthly tab dividers, wire-o binding and much more. Wire-o Binding allows the diary to lie completely flat when open. 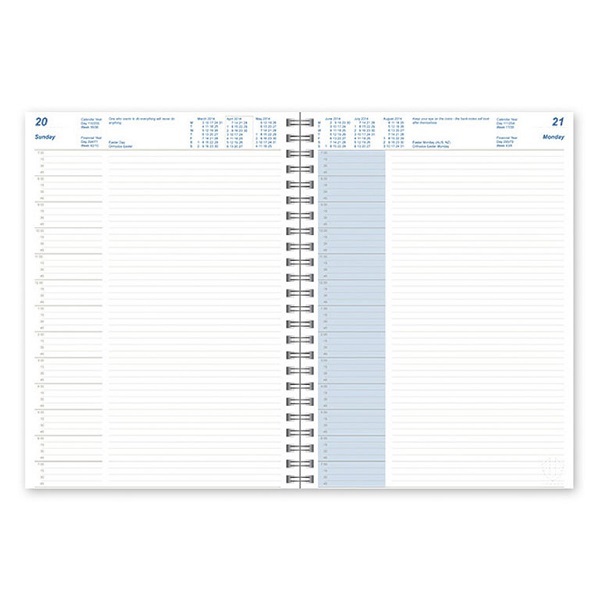 Monthly tab dividers and two ribbon markers provide the user with quick access points to chosen sections. PVC pockets for storage. All Upward diaries contain extensively researched information on every page like full moon, religious calendar, equinox/solstice and much more. The pinnacle of the Upward range, the Nobel A4 diary features a textured PU cover with a blind embossed logo making it a sophisticated addition to your workspace. Features mylar reinforced monthly tab dividers, two ribbon markers to provide the user with quick access points to chosen sections, PVC pockets for storage.and wire-o binding for lay flat opening. Layout - 1 Day to a Page with 15 minute 7 am - 7.45 pm appointments.